Samylin Liver Supplement is a complementary product which increases and provides the antioxidants used by the liver for detoxification. The liver has a key role in many body functions such as metabolism and storage of nutrients, detoxification of potentially harmful substances, digestion of fats and immunoregulation - as such, it is exposed to many potential threats and toxins every day. 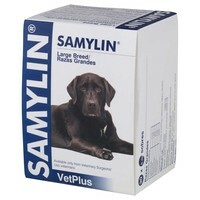 Samylin contains the glutathione precursor SAMe, the direct antioxidant and thiol donor Silybin, Vitamin E and Vitamin C for use in cases of hepatic disorders. One sachet per 5kg of bodyweight per day, mixed with food.